Jennifer and I both came from small towns in the Midwest. Both of us had parents that instilled great work ethic as well as the need to be outdoors. In the Midwest, that's code for manual labor outside. Don't get me wrong, we both enjoyed our childhoods and we had plenty of fun along the way. But we also learned quickly that life could be hard and that there was a time for work and a time for play. Play almost always followed work and if you worked hard enough, play might mean something really fun. Like fishing, camping or hunting (in my wife's case for mushrooms) with our parents. Whether we realized it or not these activities, whether work or play, were building the foundation for our love of nature and the outdoors. Little by little, as we grew older and matured, we started looking at our surroundings less in relation to the amount of work left to be done and more for the beautiful landscapes that we were a part of. For me, a summer afternoon of pitching hay into the back of a pickup truck quickly turned into laying in the bed of the truck and staring at that big prairie sky. Still to this day, when I close my eyes, I can see the slow moving clouds, hear the sound of the wind blowing through the prairie grass and smell the fresh cut hay in the pasture. Fast forward several years... Jennifer and I had just graduated college and moved from Chicago to Virginia Beach. We were new to the east coast and southern living. Our free time was mostly spent exploring the surrounding areas and camping. We found that we really enjoyed camping in the Outer Banks of North Carolina and the Appalachian Mountains of northwestern Virginia, as it was so different from anything we’d experienced in the midwest. We were in our twenties, having adventures and life couldn't get any better! As we started to approach our thirties, one particular conversation kept occurring. A conversation that would lead to our greatest adventure ever. Parenthood. With the birth of our oldest daughter Hadley, we challenged the unknown like we had done so many times before. But as new parents, we found ourselves acting less adventurous and more conservative. We traveled that fine line of being over protective as we were always trying to do everything right the first time. So much, that we had put our love of the outdoors on hold and focused all of our attention primarily on her. We pretty much ran ourselves ragged. About the time Hadley was 3, we had our second daughter, Bailey. She unlike her sister was a little more, what’s the word I’m looking for, spirited. Yeah, we’ll call it spirited. Again we found ourselves running nonstop and were desperately in need of a break. Some type of vacation was in order and with kids we realized that it took a little more planning than just jumping in the truck and heading to the mountains like we used to. After much debate, we bought an old Coleman pop-up camper and once again began to spend our weekends camping. But unfortunately, that only lasted a few years until the roof went bad on the camper and we were forced to get rid of it. In the search for our next adventure, we went the complete opposite direction and bought a 20ft Cuddy cabin boat. Again, we spent our weekends outdoors, running up and down the Inter coastal water ways exploring and playing on the river. From time to time we would anchor off in a cove somewhere and spend the day and sometimes even the night. We clearly loved exploring and the adventure of not knowing what you may see next! After a while, we grew increasingly tired of being blasted by the sun on a day to day basis and had all but run out of locations to explore on the river. The kids enjoyed spending time in and on the water, but enjoyed the exploring and camping parts more. So, still thirsting for adventure and exploration, we turned back to camping and to the mountains. At the time we had a 2000, gas guzzling beast, Dodge Durango. It had a 5.9L Magnum V8 and was 4 wheel drive. Insert Tim the Toolman Taylor grunting noise here! We bought a new tent from REI and brought just about every piece of camping gear we could think of. Remember, we had just come out of boating and a pop-up camper, so we packed accordingly. Meaning we brought everything including the kitchen sink. A two day trip looked like we were out on a ten day expedition. We were staying in State and Federal Campgrounds and that was the norm. That is until the day we took a drive down Coal Rd to go hiking in St Mary's Wilderness. There were vehicles pulled over and people were just camping in the woods. It looked so peaceful. Imagine, no more putting up with the group of college kids or the partiers the next site over. Just us and nature. We liked the sound of that! As soon as we got home, we started scouring the internet and found all kinds of dispersed camping throughout the Blueridge mountains. Dispersed sites you could hike or drive to. Then it happened, we discovered Overlanding! Not only did we discover it, we also discovered that we had done it quite a few times already. So we dug further in, gathering as much information as we could. We found out that it was very popular in South Africa, Australia and on the western half of the United States. We discovered Ronny Dahl, Expedition Overland, Andrew St. Pierre White and a local group, Mountain State Overland. We watched their videos over and over and I started doing little things to the Durango in the hope to build our very own overland rig. I built a storage box for the rear and did my best to imitate the rigs the professionals use. You know, the ones that were built by people who's pockets seamed as deep as the Grand Canyon itself. The Dodge was an alright off-road vehicle, but there wasn't a whole lot of aftermarket support for it. Parts like suspension upgrades, armor, recovery gear were all but non existent, causing me to come to a screeching halt very quickly. A decision had to be made. Keep going with the Dodge and fabricate one off parts or find some other platform that has a lot more options and support. With my decision made, I began to look for a better platform from which to build our overland vehicle. Eventually I found a really good deal on a 1993 Toyota Land Cruiser. Now all that was left was to convince my wife that we needed a third vehicle and this 230,000mi Toyota was a sound choice. Surprisingly the talk went better than expected and she agreed with one exception. Her exact words were "If we do this, we do this as a family. Not just camping, but all of it. We get to help repair and outfit the truck too." Wow! I was in shock! I thought I was lucky enough just to spend time with them in the outdoors, now we get to build the vehicle as a family! What more could I ask for? I don't think I could have been any happier! Obviously I agreed to her terms. We bought that Cruiser and Jennifer and the girls have helped with just about everything along the way. It goes without saying, we've had some amazing Family Adventures Overlanding and we haven't looked back since! Our trip through the Midwest in the summer of 2017 was a diverse one to say the least. 10 states, 5000 miles and 15 days on the road allowed us experience a lot of different environments, weather conditions and landscapes. For the most part, we experienced what we expected from all the states, but one. We were on day three of our trip and we had just spent a sleepless night, due to severe weather, in Arrow Rock, Mo. It was an early morning and a wet start and we only had a few things on our mind. Coffee, Adventerure Motors in Kansas City and Toadstool Geological Park. With warm coffee finally in our bellies and the kids situated in the back of the Cruiser, we made the short jaunt to Kansas City to visit the guys at Adventure Motors. They were lending a helping hand in replacing a faulty piece of equipment in our rig. After a tour of their facility and some great conversation, we hit the road and hit it hard! We had 665 miles to travel to make it to Toadstool Geological Park in the northwest corner of Nebraska. Nebraska. What can I say. The state is full of long and painfully straight roads, surrounded by corn fields as far as the eye can see! Exactly what we expected and were dreading. As we made our way across the state, it became painfully obvious that we were not going to make our destination unless we drove long into the night. We had a decision to make. Keep going or find another place to camp. I for one, was not to willing to make camp in a remote area, late in the evening, after a sleepless night. So at our next fuel stop, we decided to look for alternatives. Fueling up on the outskirts of Bridgeport, Ne, Jennifer discovered a State Recreation area on the other side of town. With exhaustion setting in, we decided to go have a look. 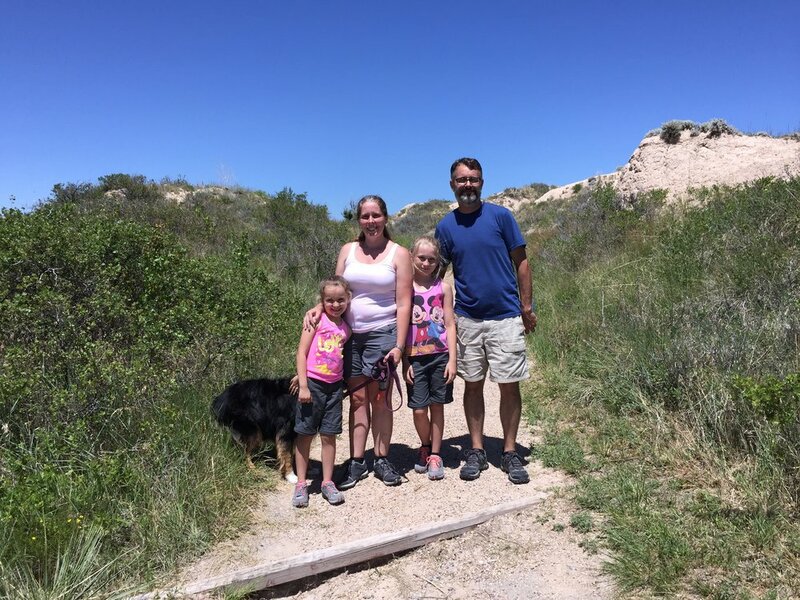 Driving through the quaint little town of Bridgeport, named for the bridge just north of town that was constructed in the late 1800's and crosses the North Platte River, we made our way toward the Recreation area. There wasn't much activity in town and it almost seemed as if the town of 1500 was more like a town of 500. Once we pulled into the Recreation area we discovered why. It was as if the entire town was camped there! We made our way around the lake looking for any resemblance of an open site. Being a Friday night though, we were not having any luck. Campers, tents and RV's littered the camp sites and it appeared we would have no choice but to continue on. As we were rounding the lake, we noticed that the designated campsites ceased, yet people were still camped along the shoreline of the lake. We pulled into a open gravel area and reassessed our options. As we were sitting there, we noticed several tents set up on the gravel lot which was obviously the parking lot for the boat ramp. Not only were they set up, but they had campfires going. A short time later a Park Ranger and a Game Warden drove by. After witnessing the Ranger passing by without issue and taking into account how tired we were, we made the decision to pull the Cruiser into a grassy area adjacent to the parking lot and set up camp. We deployed quickly and decided to enjoy our first night, in camp before sunset, with a walk to the pay box and around the lake. The views were absolutely breathtaking as the sun faded over the horizon! The next morning Jennifer and I awoke early as normal. Enjoying our coffee and our lakeside view, we discussed the plans for the day ahead. During our conversation, we noticed we had received a message through our Instagram account suggestiong a place to see in the near by area. With our curiosity peaked, we decided to wake the kids and get a move on! Back on the road, we followed the signs, as suggested, to Scottsbluff. Driving through the the Nebraska countryside, we began to wonder, what could be so amazing out here that someone felt it was something we couldn't miss? Then we saw it, Scottsbluff! 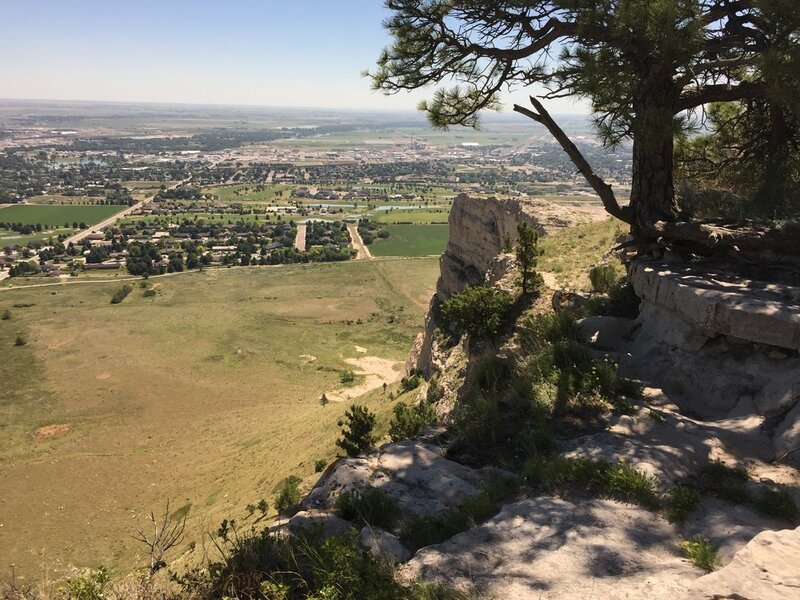 Scottsbluff is just another small Midwest town. However, Scottsbluff National Monument, just south of town, looks like something that is more suited for monument valley in Utah. than rural Nebraska. Ascending the bluff on the Park's paved road to the top, we took in the amazing views. Towering 800 feet above the surrounding North Platte River, the views were stunning! Off in the distance you could see Courthouse Rock, Jail Rock and the unmistakable Chimney Rock. We took our time exploring the hiking trails on the bluff and made sure we took in the views from every vantage point possible. Once we had our fill, we made our way to the bottom and stopped at the visitor center. There we discovered that not only does the historic Mormon Trail run on the north side of the bluff, but our Cruiser was parked exactly 50 feet from the legendary Oregon Trail! Needless to say, we couldn't leave there without walking at least part of the trail. Once on the trail we met a Park Ranger that gave us a historical walk through of what it would've been like walking the Oregon trail. Dressed in period correct clothing and using wagons and fake oxen they had replicated on the trail, did wonders to give us real insight into the humongous under taking the pioneers accepted on by traveling west. Passing between Sentinal and Eagle rock at Mitchell pass, we found the wagon wheel ruts were still present in the dirt below. A marking that has forever changed the landscape and tells the tale of the thousands of people who tempted fate as they traveled west. Approaching lunch time we decided to have a quick bite to eat and get back on the road. Northbound and on our way to Toadstool Geological Park, we passed through a rural area that had been devastated recently by a tornado. Most likely by the same storm we experienced in Missouri. As we drove through the the countryside, we looked around with a sobering awe at the damage. Homes and barns had been ripped a part. Tractors and machinery had been tossed about and the irrigation sprayers in the fields were twisted up like pretzels. Debris was everywhere! The families were walking about their properties, assessing the damage and trying their best to clean it up. What an amazing testimate to them and the human spirit for forging on in the face of tragedy! We Turned off the hightway just north of Crawford, Ne and made our way through the countryside. Traveling down a long and dusty road that mirrored the adjacent train tracks, we couldn't help but get lost in the beautiful surroundings. The landscape was changing from the flat prairies to a small valley with rock formations that closely resembled the badlands of the Dakotas. Making our way into the park, it felt as if we'd just landed on some distant planet. The landscape was like nothing we'd ever seen before. Stepping out of the Cruiser we made our way through the gate and onto the 1 mile trail loop that runs through the geolgic park. One of the most amazing things about this park is that it is completely open to exploration. Meaning you can pretty much venture away from the trail at anytime to explore. The trail itself was marked by steel poles with numbered placards attached, driven into the ground. If you didn't pay attention, it was very easy to get lost in a few sections. But that only added to the mystery and the adventure of the park, in our eyes! Walking up and down the rock formations and standing next to shear drop offs, we saw firsthand how Mother Nature's power had slowly eroded these landscapes and created the amazing formations before us. The deeper into the park we traveled, the more we felt as if we were on some distant planet exploring it for the first time. Fossils could be seen all around us in the rock faces. It's quite an experience to be able to touch history rather than view it behind a pane of glass in some museum. It was truly something we had never experienced before. After making our way back to the trail head, we loaded up into the Cruiser and drove all of 100 yards to a Pioneer sod house adjacent the parking lot. The summer sun was unrelenting and we were ready to get out of the heat. But we'd be remiss if we didn't take the time to explore this historic recreation of a pioneer house. As we approached the house, the thick mud walls stood out more and more. The walls had to be at least 12" thick! Once inside, we found the air was rather cool and the living area was somewhat spacious compared to other pioneer homes we had visited. The mud walls actually acted as a thermal barrier and kept the house fairly comfortable! Walking to the back of the structure, we were amazed by the view of the geologic park. Could you imagine? Being the only one for miles? Living in a sod house with such an amazing view? We're sure during the times it was looked at more along the lines of survival and with less of a romaticized tone. But we still couldn't help but pose the question, was it really all that bad? Caution: Using a propane burning heater should never be taken lightly. It should never be used anywhere near the Tent material or your sleeping bags! Always make sure to have adequate ventilation! Now that we have that out of the way, we can continue. We have found the best solution for us is to install our RTT annex and place the Mr. Heater on a Ridgid case in the center of the floor of the annex. We run a propane hose from the heater out the door and to a propane tank. You can use either a 5lbs or 20lbs propane tank. The 1lbs propane tanks that are meant to be used with the heater do work, but you’ll most likely find the heater will run out of fuel in the middle of the night. With the heater running, the heat will rise up into the tent and keep you toasty warm. It’s besr to leave a window cracked open for ventilation and to help control condensation in the tent. One other thing we highly recommend is a good battery operated carbon monoxide detector. The Mr. Heater does have an auto shut down feature if the falls over or the oxygen levels get to low. But relying on that would be unwise as you will be above the heater and the levels may not be the same as down below where the heater is at. We usually place the detector by our pillows for the best monitoring. That’s just a quick run through of our typical winter sleeping setup. Are these the best options for everyone? Well, that’s for you to decide. Hopefully you can take something away from these tips and it can help turn that frigid Forrest into a winter wonderland! Recently, we had the opertunity to play with the new TemboTusk Adventure Skottle. To be honest, we were a little skeptical as to whether we'd like it. But based on how much we love its larger brother, we figured it was worth a try. Thats not to say we didn't have our concerns though. It is quite a bit smaller and it costs just as much as the original Skottle. Not to mention, if you throw in the cost of the MSR Dragon Fly burner, the price becomes staggering! Now, with that being said, we understand if you already have an MSR Dragon Fly burner, that the price is a lot easier to swallow. For us though, the question still remained, is it worth the price? For us, a family of 4 who doesn’t own an MSR Dragon Fly, we’re more likely to stick with our original Skottle. But that is due more to the size of the cooking surface, than the price. As far as the value is concerned? Once you carry, setup, cook and tear down the Adventure Skottle, you really start to see why this little guy is worth the price and then some. Everything in the kit is well thought out. The cooking surface is much thinner and since it still uses a 10,000btu burner, it transfers heat faster allowing for quicker cook times. The entire kit fits in one easy to stow, easy to carry Blue Ridge Overland Gear storage bag and it’s super light! Light, like the weight of one leg from the original Skottle light! A big plus! Anyone who has lugged the original Skottle around knows it's almost in the heavy weight cast iron class. So having something that weighs next to nothing but still performs like a full size Skottle is something to take note of. But the burner.. We were still hung up on that burner... Don’t get me wrong, the MSR Dragon Fly is a great burner and you can use a bunch of different fuels in it, proving it to be one of the most versatile burners on the market. But that's not what we need and it’s not for us. If we were on a global expedition where different fuels were a problem to obtain or we were through hiking, maybe we'd have a different opinion of the Dragon Fly burner. But we camp out of our Cruiser and already carry propane and Jetboil canisters. We’re not really interested in carrying another type of fuel. That just takes up more space and detract, for us, from the main advantage of the Adventure Skottle. It's size. So, we made a call to Jerry at TemboTusk and asked if he had tested any other burners with the Adventure Skottle. Like maybe a Jetboil, fingers crossed. After a brief brainstorming session, we managed to come up with a solution to adapt the Jetboil Mighty Mo burner to the Adventure Skottle and give it a test! What were our impressions? Talk about a match made in heaven! This burner is ultra compact and runs on your typical Jetboil canisters. It has its own igniter and the heat is extremely adjustable. Just like the Dragon Fly, the Mighty Mo burner is rated at 10,000btu. Also with this burner, the Adventure Skottle seemed to be quicker to setup, took up less room and is highly portable when assembled. Picinic tables, tailgates, patios, boats, you name it, it works! We are extremely impressed with the versatility of this new combination and it has changed our opinion greatly. The biggest advantage of all? The Mighty Mo is only $50. That’s $50 compared to the $160 of the Dragon Fly! That’s an opinion changer! Now we're not saying that everyone should run out and buy this thing and it will magically solve all of your camp kitchen needs. What we are saying is take a real close look at how you travel and what you need from your kitchen. Then, if you're considering a Skottle, compare that to the two options before you. The full size Skottle can cook more food at once, but is heavy and takes up a good amount of space. But it does run on propane. The Adventure Skottle cooks less food, but faster. It"s lighter and takes up a lot less space and can be run with multiple fuels depending on which burner you select. Keep in mind, when we say less food, remember that the full size Skottle cooks enough food to feed your camp and the camp next to you. Probably not something that you're going to want to do very often. So where does that leave us? Again we ask that you remember that this is solely our opinion. The Adventure Skottle with the MSR Dragon Fly burner works well, but is just to dang expensive for us. We're not a big fan of this burner and feel its a little clunky to use. If you have an MSR Dragon Fly, and you like to use it, then this may be the setup for you. The Adventure Skottle with the Jetboil Mighty Mo burner, now that's something we can get on board with. We already carry the fuel and we love this burner. It's small, inexpensive, quick to set up and compliments the Adventure Skottle nicely. As for the question of if we're going to purchase one? If you'd asked us that question at the beginning, without a doubt we would've said "no." Now that there is another burner solution that is more within our realm and price range, we'd say there's a really good chance this little guy is going to become a part of our family. Adventures... Well, that comes from the crazy journeys we embark on. Hiking, Overlanding and Exploring destinations all over this great land! It really doesn't matter where it is, we find adventure almost everywhere. Adventures that teach all of us new lessons and skills. Most importantly, adventures that allow our children to come out of their shells and blossom! Adventures that create everlasting memories! Veteran - “A person who has served in the military.” That definition does not do the word justice. Our service Men and Women have one of the most difficult jobs in the world. But that burden is not only theirs. It’s a burden their family must share as well. The sobering truth of the matter is that some family members never get to meet their mother, father, brother, sister, etc, because some of our Vet’s never make it back. Those that do.. Well, they may be forever changed. Today we would like to ask you to do something. Not just today but especially today... Look to your left, now to your right. Every person you see before you has been touched in some way by a service member or their family... This next part is a little more difficult, but with a little courage It can be done. Pick one person that you see. Walk up and introduce yourself. Thank them for their service or the service of their family member and take the time to get to know them. Listen to their stories. Share their joy and their pain. Laugh and cry with them. Help heal the pain that the burden has left. Then and only then, will you truly understand what “Veteran” means. As for the photo? That is part of my family’s story. The statue of the soldier is my Great Uncle Albert. He, like many, lost his life in Korea at the young age of 19. Many in my family never had the chance to meet him, including a few of his brothers and sisters. I too, didn’t understand the definition of “Veteran” until I came here with my grandmother. Until I listened to her stories and watched her break down at the shear sight of the memorial. It was at that moment I learned what the meaning truly was and what sacrifice really is. I will forever be grateful and supportive of our service men and women and their family’s. Thank you all for your service! Land of the Free, because of the Brave!! Spring of 2016, as we started watching more and more Overlanding videos, we began researching gear and products that we could use on our trips. All Jeremy kept talking about was a Skottle that he saw on an episode of Mountain State Overland on YouTube and how that was a must have in our gear. To be honest, all I thought was “What is he talking about?" and "What the heck is a Skottle?” As the days went on, he kept telling me all about the Skottle and kept going back to the fish taco episode from MSO. Clearly he was excited about it! So I decided to start searching for this Skottle thing he wanted and thought it might make a great Father’s Day present. 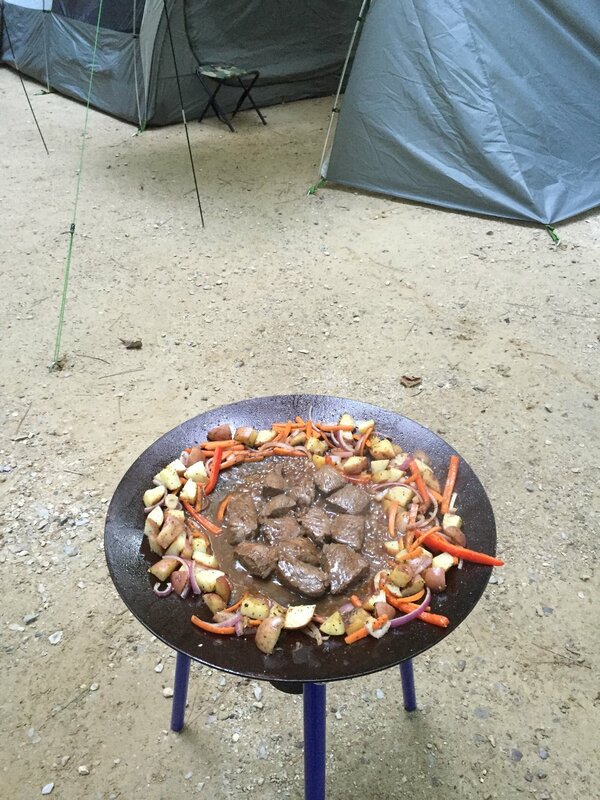 Not realizing however, that it would ultimately change our camp kitchen and what we cooked at camp and at home! With my internet browser in hand, I did a quick search. Low and behold I found his crazy Skottle thing he wanted from TemboTusk in California! Then as I dug in more I found out that Blue Ridge Overland Gear also sold them and they are right here in Virginia! Which works out great for me since we live in Virginia! I told the girls what we were getting Jeremy for Father’s Day and they made sure it was the thing that he could cook fish taco’s on! I assured them it was. We got the Skottle ordered in time to arrive for Father’s Day. Hadley and I told Bailey that it must stay a surprise for Jeremy, since Bailey can’t keep a secret and we were almost sure he would find out before it came! About two days before Father’s Day I checked the tracking number of our Skottle, only to find out that there was an issue with shipping…. Concerned, I made a quick phone call and luckily I was able to contact Matt at Blue Ridge Overland Gear and he was able to make sure that our Skottle and bag were delivered the day before Father’s Day! The Saturday before Father’s Day I asked Jeremy what he wanted for his Father’s Day breakfast and all he said was “It would be great to have an omelette made on a Skottle, if only I had one…..” It killed me knowing that it was wrapped and hidden away for the next day, but I knew that he’d have plenty of opportunities to make omelette’s on it in the days to come. Father’s Day morning came and he had to settle for an omelette from on the stove. I know, poor guy… After breakfast, he had to run a quick errand. Which gave the girls and I time to get his present out so we could surprise him when he got back. Since we don’t normally exchange gifts between the two of us for any occasion, he was a little surprised when he got home and saw two big boxes in the kitchen. All he had to say was “I know you didn’t buy me anything for Father’s Day?!? !” I said “No I didn’t. The girls did!” We had him open the box with the Skottle first. As he saw the TemboTusk logo stamped on the side of the box he stopped for a second and said “I know exactly what this is and you shouldn’t have!” He finished unwrapping everything and he couldn’t set it up fast enough. He was determined to test it out right then and there! The first thing he made was fried summer sausage, since it was readily available in the fridge. But shortly after, we loaded up and headed out to the store to pick up stuff to make shrimp tacos!!!! That night, as we made dinner and experimented, I finally started to realize what all of his hype was over this thing and why he wanted a Skottle so badly…. The shrimp tacos where amazing and cooked really fast! The girls devoured their grill cheesed sandwiches and to this day, when they want a grill cheese sandwich, they want it made on the Skottle. Simply because it tastes better! From that one meal, we realized that not only do we love cooking on the Skottle but our girls love cooking on it as well! Still to this day they’re always asking what they can do and what they can cook! We began experimenting more and more with the Skottle at home. Trying quick camp meals like, eggs, pancakes and french toast for breakfast and hotdogs, burgers and grilled cheeses for lunch. 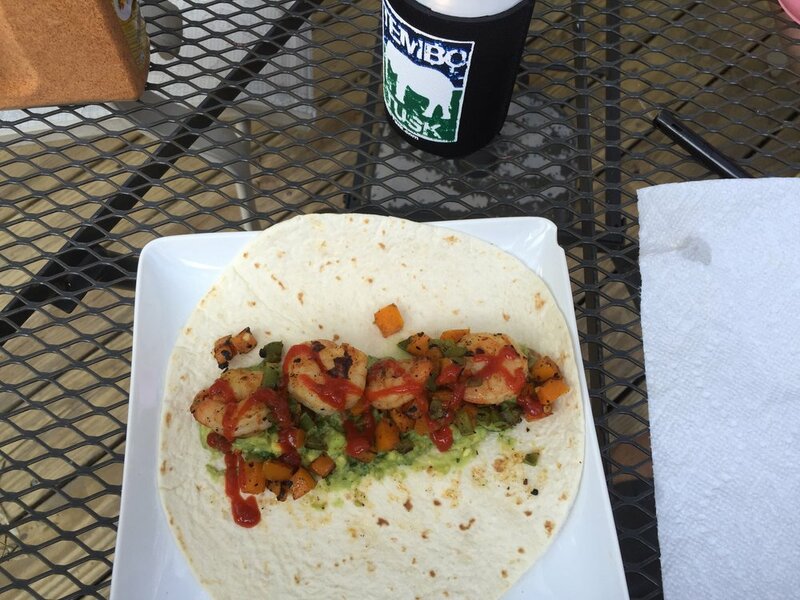 Then we got more creative and started trying gourmet meals like beef tips with potatoes, kielbasa with pirogies, and of course our favorite, shrimp tacos for dinner! As we found more and more things that we could cook on the Skottle, I became more intrigued by the possibilities and decided to figure out a way to make cinnamon rolls on it. Our girls love cinnamon rolls and lets be honest, who wouldn’t love to smell cinnamon rolls baking on their Skottle while drinking coffee at camp?!?!?! I knew to start “baking” on the Skottle I would need a lid. Luckily, TemboTusk sells that as an accessory! Once I got the lid, a whole new world opened and I discovered the possibilities of what a Skottle really can do!!! It didn’t take long for fresh cinnamon rolls to get added to our meal planning for trips and it didn’t stop there. I was now determined to make apple pies and after a couple of failed attempts I had success. They were amazing!!! Over the summer and fall of 2016, as we meal planned for our trips, we found that we were using the Skottle more and more. After just a few trips we realized that we were no longer using our cast iron pans, or any of our big pots and pans for that matter. The Skottle had replaced all of them! So as most of us do, we unpacked our kitchen gear and re-thought about what we actually needed and used from trip to trip. We realized we didn’t use the 2 burner Coleman stove anymore but we did still needed something to boil water and make coffee with. So we purchased a Jetboil Flash with a coffee press and a Sea to Summit collapsable pot to take care of those things and said goodbye to the Coleman stove, cast iron pans, and all the other various sized pots and pans we carried. Now all of our cooking is done on the Skottle and Jetboil Flash! If you’ve followed along in our journey so far, you can probably see how the Skottle has changed what we cook at camp and how having the Skottle and gives you endless possibilities of what to cook and bake! I am never done experimenting. Actually, I have a list of recipes that others want me to try to make along with a few other things I came up with. So there is still a lot to come! Needless to say, we love our Skottle and the possibilities it has opened. We can’t say for certain that you will love a Skottle as mush as we do, but we can say you’ll never find us without ours! If you are looking into buying one or are new to owning a Skottle and would like some extra tips, we have posted some videos on our Youtube channel that maybe useful to watch. We have a setup, cleaning, and several cooking videos posted there. As always, if you have any questions about any of our gear that a you may see, please send us a message! We look forward to seeing how you like your Skottle and the meals you cook on it!! We recently had the pleasure of attending the 2017 Virginia State Parks Rooftop Tent Rally at The James River State Park, just north of Gladstone, Va. The event was put on by Virginia State Parks, Blue Ridge Overland Gear and Mountain State Overland. There was a vendor area and a large open field for camping. The vendors included Blue Ridge Overland Gear, Mountain State Overland, Rove Rentals, Overland Gear Exchange, Freespirit Recreation and Tepui. Classes on Route planning and Basic Overland safety and preparation were held in the pavilion and provided by East Coast Overland Adventures. Saturday evening there was a live band playing country, classic rock and bluegrass music in the camping area. Large bonfires were erected and supervised by the Park staff and local Fire dept. After the band finished up, Mountain State Overland set up their portable screen and projector and treated everyone to their latest episodes. Jennifer and I spent the majority of the weekend in the Freespirit Recreation booth talking shop with the people stopping by. We did manage to get away several times though and made our way through the Campgrounds to meet fellow Overlanders and their families. We were fortunate to meet so many great people and got to hear about their experiences. Sunday was the last day of the event and the day everyone was waiting for. Not because they were ready to go home, but instead, they were anticipating the raffle and giveaways! The James River State Park, Rove Renals, Tepui and Mountain State Overland kicked it off by raffling off some cool swag and gift certificates. Blue Ridge Overland Gear threw in one of their awesome Fluid/Oil storage bags and East Coast Overland Adventures donated a copy of their "No highways Tour" book. Rodney and Dona of "Overland Medic" donated a set of Ridgid off-road lights. Freespirit Recreation donated a camp ReadyLight and Overland Gear Exchange capped off the door prizes with a free one night stay in their new Conquer off-road trailer! It was pretty cool to see people winning these door prizes just for showing up and camping for the event! After all of the door prizes were handed out, the grand prize was raffled off. All of the proceeds for the raffle tickets would be going to the Friends of the James River Foundation and will be put directly back into the park. Something we can totally get behind! As for the Grand Prize.... It was a brand new tent donated by Tepui! Imagine that! A $10 raffle ticket wins a brand new tent! What an event! Can't wait for next year!! Rick’s Place is truly a gem hidden on a back country road in Henry County, Va. Nestled on the banks of the Smith River, this oasis offers up beautiful views of the surrounding mountains and tranquil sounds of the river. There’s a small cabin, a fifth wheel camper and a pull behind camper for rent. The pull behind camper has its own covered porch with onsite bathroom. There are also three other sites available with full hook ups and there’s a small area at the end of the camping area that accommodates primitive tent camping. Primitive may not be the correct word to use as all of the sites have a beautiful view of the river and access to the lower riverfront terrace. On the terrace, there’s a horseshoe pit, hammock and patio area as well as several areas to access the river. Rick prides himself on taking care of his guests and provides such things as firewood, canoes and a paddle boat at no extra cost! Adventure was on our minds as we drank our blissfully warm coffee and stared out into the mountain mist. Today’s agenda was simple. Go for a stroll through the woods and let adventure find us! With the kids finally up and ready to go, we bid farewell to our friend Adam as he broke camp and began to plot a route to his next destination. Our day pack in hand as well as the poorly marked trail map supplied by the camp host, we embarked on our journey. The trail head was nicely marked and the path appeared to be well groomed. As we made our way down the path, we looked at the map and decided on a nice loop trail picking the shortest leg of the trail for the decent down to the lake shore. A quick pay off to keep the interest of the kids. However, we were having a difficult time locating the entrance to that particular trail. We came upon an arrow sign pointing in the direction of the lake. Confuse, but assuming this must be the trail, we turned and started our decent. The decent only lasted 50ft and we found ourselves walking a level grade just behind the campsites. A quick examination of the map showed that we were not on the trail we thought we were. After an about face, we made our way back to the original trail and continue in the direction we were previously traveling in. Half a mile later, the path was began to narrow and overgrowth started to become an issue. As we made our way through the overgrown sections, doubt began to enter our minds as to whether this was the correct path or was just another miscalculation. We pressed on nevertheless. That is until we came to the section that resembled a South American jungle. Not being one to give up easy, I pressed ahead to Scout the trail. Half a mile ahead and several more jungle like sections, I decided to call it. There were no markers and there was no other trail in sight. With my head hung low, I made my way back to Jen and the girls. This was not the way we would get to the lake. Not with out contracting poison ivy or getting all scraped up. After a quick regroup, the decision was made to head back to the first trail we turned down and see where that one went. Again, we headed down the trail marked by a single arrow carved into a wooden plaquarde. We descended down the all to familiar section and made our way past the camp sites. Three quarters of a mile later, we found a sign with actual writing on it! They do exist!!! Now that we knew exactly where we were at, we just had to decide between two options. Turn left and we would begin the long switchback portion of the loop trail we were originally looking for, or go straight and go towards whatever is marked as cove. Our curiosity peaked, we went straight. For the next mile or so the elevation of the trail fell slow and steady as we wound our way down into the valley. The trail started to mirror a dried up creek bed to our immediate left and the descent became ever more difficult due to erosion and abundance of exposed tree roots. The air started to become moist and cool as the sun was blocked more and more by the dense canopy above and it felt more like evening than mid morning. In the distance, a glimmer of light could be seen and we could just barely make out the tree line. Making our way toward the warmth and the light, we traversed fallen trees and washed out hillsides til we were greeted by the rocky lake shore. Making our way out of the tree line, stumbling over fallen trees and large boulders, we found a nice place to sit and reflect on our journey. 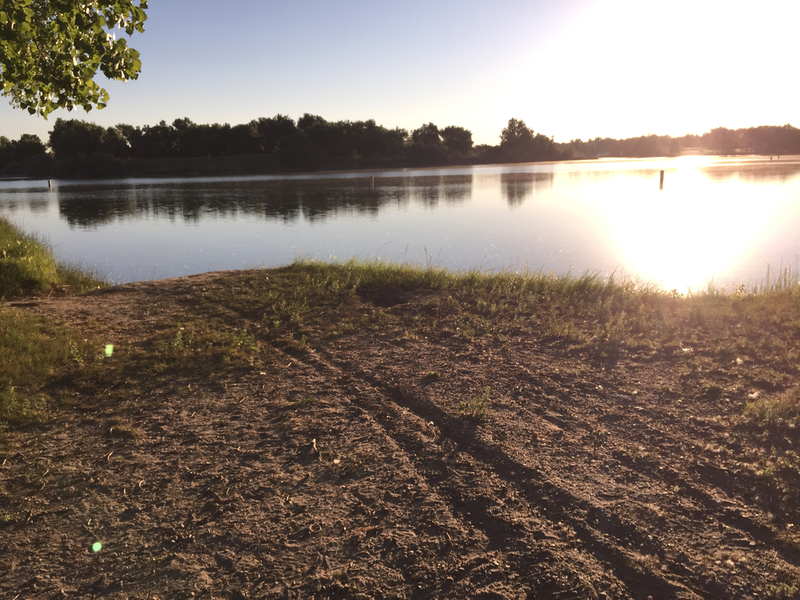 The kids stood at the waters edge, tossing rocks into the lake as Jennifer and I watched on, reveling in the accomplishments of our children and how they overcame each and every obstacle set before them. The journey was not without it’s hardships mind you, but with determination and confidence that we could work as a family, we proved yet again that we could take on adversity and we could triumph! Today was a good adventure!